The Saraswati Mandala School is a non-profit project, all income coming exclusively from donations. With your financial contribution you help us keep this wonderful project running and growing, and support the children of beautiful northern Bali obtain a better English qualification. Thanks to donations we can pay for teaching materials, electricity, water, Komang Adis (our permanently employed Balinese teacher) salary and other expenses that are necessary to keep the school and the daily lessons up and running. Terima Kasih – many thanks in advance! The school project has an Indonesian PayPal account that is directly linked to the school’s bank account in Indonesia. If the page that appears after clicking on the “Donate” button is in Indonesian language, please switch to English (language choice is located on the right top of the page). 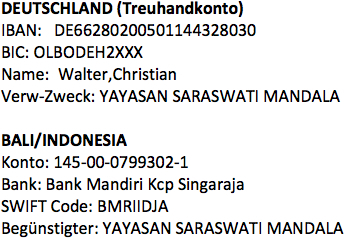 Yayasan Saraswati Mandala is a 100% Indonesian foundation with no registered offices in Germany. This is why, unfortunately, we cannot make out any donation receipts that are compliant with the German tax office requirements. Many thanks for your understanding! Related to this, also for your information: for amounts up to 100 euro you don’t need a donation receipt, but you do need to make a comment when you submit your income tax return. For EVERY donation we make out a confirmation receipt, but please be aware that this document might not be tax-deductible.